Cook right along with best-selling cookbook author and Food Network star Paula Deen! 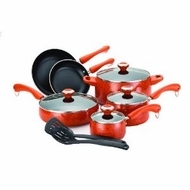 It's easier now than ever thanks to Deen's 12-Piece Signature Cookware Set. With a 1- and 2-quart covered saucepan, a 2-3/4-quart covered saute pan, a 6-quart covered stockpot, and 8- and 10-inch skillets, you'll find everything to need to cook on a daily basis at-the-ready. Paula Deen's pots and pans, with their speckled, stain-resistant, porcelain enamel exterior and easy-to-clean nonstick interior, are made of sturdy aluminum so foods heat quickly and cook evenly. The dual-riveted, rubberized handles stay cool to the touch and sport a copper-plated ring for convenient hanging. Tempered glass lids lock in moisture, nutrients and flavors, and let you to watch your food cook without lifting the lid. A heat-resistant, non-abrasive slotted turner and slotted spoon complete the set and allow for stirring, flipping, and serving culinary creations with no risk of scratching the nonstick interior of the set's pots or pans. Hand wash only with non-abrasive pads and liquid detergents. Paula Deen's Signature saucepans, stockpot, and skillets should not be used on glass cooktops, but are oven-safe to 350 degrees F and carry a limited lifetime warranty.